In order to get every child in an elementary school classroom by the year 2015, the world would need 4 million more teachers. That's according to a new report from the United Nations Educational, Scientific and Cultural Organization (UNESCO), which details the acute global teacher shortage currently taking place in 93 countries. If these countries were to achieve universal primary education over the next few years, they would need to hire millions more teachers, UNESCO found. The release of the new report coordinated with Sunday's World Teacher's Day. While the researchers noted that it is unlikely that the world will achieve universal primary education by 2015, researchers expressed hope that the goal may be more attainable in future years. 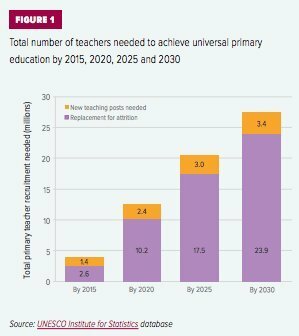 Still, the need for more teachers is expected to increase over time. UNESCO found that the world would need more than 12 million additional teachers in order to get all young children in school by 2020. Of this 12 million, 10.2 million would be replacing teachers who retire, and 2.4 million would be entirely new jobs. Currently, there are 58 million children of primary school age who are not attending class worldwide, the report said. The teacher shortage is most extreme in sub-saharan Africa, where over 70 percent of countries currently need more teachers. As it stands, schools in the region suffer from overcrowding and a severe lack of resources or building maintenance. Nomzekelo Ndibongo, a third-grade teacher in South Africa, told UNESCO in 2013 that kids were leaving school because of the poor conditions. “These conditions caused some of these children to drop out of school because they cannot cope with broken chairs, broken desks and sitting on bricks, and classrooms with no doors and broken windows. So many of them dropped out,” Ndibongo said in a case study provided by UNESCO to The Huffington Post. However, in order to hire more teachers, the region would have to spend billions more in teacher salaries. For sub-Saharan Africa to achieve universal primary education by 2020, the region would need to spend $5.2 billion more per year than it does now. While some countries are expected to be able to shoulder the additional costs, a few could only hire the additional needed teachers with the help of outside donations, UNESCO wrote. 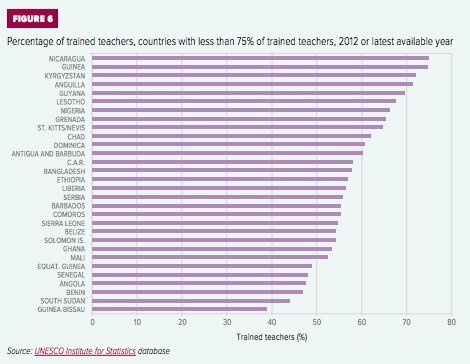 And even as countries expand their teaching force, there is no guarantee that these teachers are sufficiently trained. In places with quickly expanding education systems, teachers sometimes do not live up to national standards, UNESCO found. According to the report, that's the case in 30 of the 91 countries for which researchers had data.